Skynet - SKYNET is a distributed network of robotic telescopes controlled by a central server operated by students and faculty at the University of North Carolina at Chapel Hill. In January 2006, the first six telescopes (PROMPT) officially began operation. Two more telescopes (TTT and GORT) joined during the first year, and many more are scheduled to come online in the year to come! 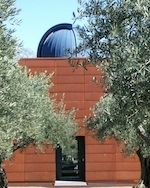 Stone Edge Observatory - Stone Edge Observatory is located in Sonoma, California. For both Skynet and Stone Edge, you will need a login and password obtained from a Stars at Yerkes workshop. Find your own! All Messier objects!